How complicated can snowboards really be? They need a wood core, some fiberglass, a turn-happy feel -- a touch of rocker doesn't hurt for that -- and some metal edges, right? 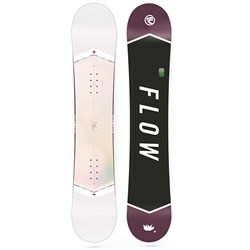 But when you're building up your first snowboard, you want to make sure that the board you go with treats you right; and whether your a seasoned vet or a newcomer looking to get beyond the bunny hill, the Flow Venus Snowboard will make you feel like your snowboarding future is bright. EZ-Rock  A hybrid of very subtle reverse camber profile with a convex base between the bindings, and camber starting before the binding zones provides stability. This makes pressing easy and improves agility no matter where you place your bindings. Flex Rating 3 (1 Soft - 10 Stiff)  Soft flex for the progressing and lighter weight riders out there. Directional Twin  Equal amount of nose and tail and a centered sidecut but featuring a set back insert pattern and core profile. Allows the rider equal opportunity for centered or setback set up. EZ 3-D Dual Transitional Sidecut  Smooth with tons of grip, the 3-D Transitional Sidecut is uniquely different between the feet. Mellow tips and aggressive radius in the binding areas gives unlimited grip for an overall smooth, agile ride. Tru-Flex Core  High strength-to-weight ratio utilizing uniquely profiled poplar wood to give you excellent all-around response in any condition. Biaxial Laminate  The special configuration of biaxial glass design creates a smooth yet responsive feel and provides longitudinal pop and torsional freedom for easier turns and a naturally easy riding board. Some models have seven strands of vertically stitched carbon stringers. 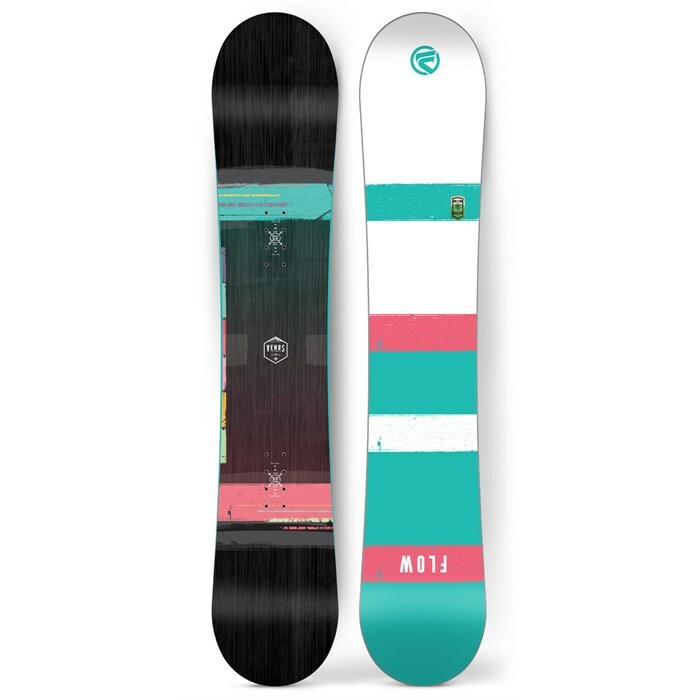 Kush-Control Sidewall  A urethane sidewall is fused directly to the wood core to reduce vibration, absorb impacts, increase edge hold, and create a smooth riding snowboard. Optix 2000  The Optix 2000 base is a low maintenance base with great strength and speed. Feel confident when ripping past your friends. Kush-Control Base  The urethane base inserts are positioned between the wood core and base material. These inserts allow flow boards to adapt to any terrain, absorb impacts, reduce chatter, and provide a smoother more stable riding experience.